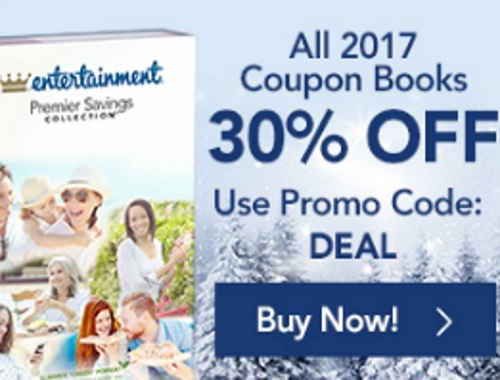 Did you pick up the brand new Entertainment Coupon Book for 2017? They are available for 30% off now with Free Shipping too! Save up to 50% off on things you do everyday, thousands of discounts with one membership. View savings for your area/city etc. Save on fine and casual dining, fast food, activities and attractions, gift cards, shopping and services, movie tickets, hotels, car rentals and airlines. Enter the promo code DEAL at checkout. Offer is valid until January 23 2017.